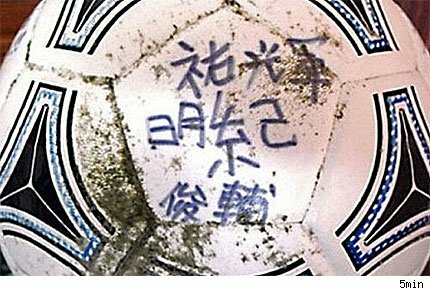 The terrible tsunami of March 11, 2011 completely destroyed the house of Misaki Murakami, a 16 year but a year later found a soccer ball that has great sentimental value for him. After the tragedy that struck Japan, the ball traveled thousands of miles to Alaska, where David and Yumi Baxter found him. Baxter marriage who lives in Anchorage, contacted the National Oceanic and Atmospheric Administration U.S. to find the owner of the ball with writing in Japanese. Murakami saw on TV the ball that his classmates had bestowed years before by way of farewell: "Misaki Murakami Courage!" can be read and is dated March 2005. The Nippon boy living in Iwate province, one of the hardest hit by the phenomenon metorológico, and wait for the Americans, who thanked the phone and which will meet in the coming months in Japan.